This month i read a fantastic book by Kathleen Givens (who sadly passed away!). I love historical romance. My favourite historical author is Julie Garwood, but i was spellbound by this story. A strong woman who i aware of another destiny, she marries a man who betrays her, but is in love with an Irishman who will stop at nothing to have her by his side. Powerful, evocative and so passionate - i was lost in this story. It's too bad i won't (and other readers!) get the next installment and find out what happens to Margaret's sister and if they find her brother. I compel you to read this book - it's beautiful! 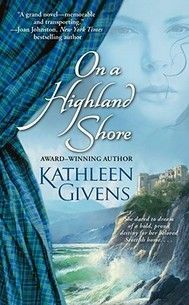 From RITA Award winner Kathleen Givens comes a magnificently conceived, intricately detailed novel that brings to vivid life the tumult, adventure, and passion of thirteenth-century Scotland, when Norse invaders laid claim to the land and its people-and an explosive clash of cultures, politics and personal pride changed the world forever. 1263: On Scotland’s western shore, the village of Somerstrath prepares for the joyous wedding of Margaret MacDonald, the laird’s daughter. But a dark storm of bloodshed and betrayal is closing in, as a merciless band of Vikings roams the seas. Margaret is determined to hold her clan together and to locate her abducted younger brother. Can she trust the noblemen from King Alexander’s court, who insist that only by adhering to a betrothal conceived for political gain will she find safety? Or should she trust an imposing half-Irish, half-Norse warrior? Gannon MacMagnus alone offers her hope of reuniting her family and vanquishing the barbarous Norsemen. In whom should Margaret entrust the fate of the rugged, magnificent land she calls home? I know someone who this book would be perfect for. Thanks for sharing your review/recommendation. thanks Steven! G;ad i could help, it is a wonderful story!